The Adidas Questar Drive hugs the foot in great comfort as what the majority of the reviewers expressed. Many buyers agreed that the sneaker displays a stylish design. The breathability of the shoe received praises from a good number of users. A couple of reviewers noted that the Adidas Questar Drive is spacious enough around the toebox and can accommodate wide feet. A user expressed that the sneaker is perfect to walk around the city. Some of the users were happy with the compliments they received when wearing the sneaker. One of the reviewers said that that wearing the shoe feels like walking on clouds. A handful of buyers agreed that they recommend the sneaker. One consumer was glad that the sneaker is easy to clean. The shoe is available in multiple colorways. The Adidas Questar Drive carries the $75 price tag. A few of the testers pointed out that the Adidas Questar Drive may run small. Comfort, style, and quality performance, the low-top Adidas Questar Drive offers them all. The mesh upper structure gives off breathability, and the sneaker as a whole feels lightweight on foot. The stylish design and the engaging colorways that add more appeal to the sneaker's appearance, serve as a massive plus for the buyers. With all of these fused together in one shoe and all for a wallet-friendly price, the Adidas Questar Drive is worth a grab. Adidas has been among the leading brands in both sports and lifestyle categories. The brand has been around a long time and yet continues to hold its solid reputation in the industry. With its success and aim of continuously providing and meeting the demands of people, Adidas established sub-brands that signify the products according to the categories they belong. The Adidas NEO is a sub-brand of Adidas which was created for the youth or the younger generations, most especially the teenagers. It promotes the fashion element and style component of its products. The Adidas NEO also aimed to offer products at an affordable price which suits best a teenager’s line of budget. Ambassadors for the brand also feature some of the influential young celebrities of the recent generation which form a better relationship and attraction to the young audience. A wide range of products is offered under the Adidas NEO in which each delivers its own style and function. 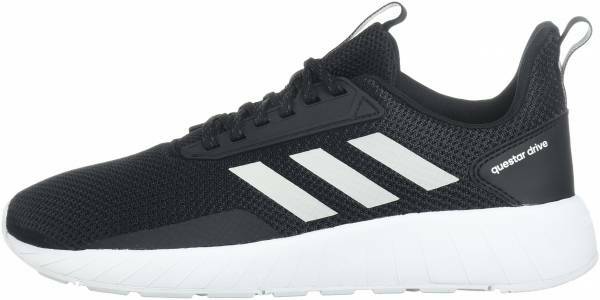 The Adidas Questar Drive conveys excellent performance and reliable quality with an appealing design that meets the needs of not just a teenager but adults as well, especially those who live an active lifestyle. The sneaker comes in multiple colorways, offering the people a good number of options to pick the pair that suits their style. Fitness or the streets, the Adidas Questar Drive performs well with its versatile characteristic that enables the wearer to rock their outfits in style. The low-top sneaker, with its sleek appearance, functions well with different outfit combinations and fits in well in various events. Whether going for a gym training session or having a casual afternoon with friends, the Adidas Questar Drive is one shoe to go. The Adidas Questar Drive may accommodate those with wide feet well with the proper amount of space it provides on its toe box. It also offers a custom fit to the wearer with its traditional lace-up closure feature. The low-top sneaker is offered in medium width and available in both men’s and women’s sizing. The men’s sizing goes from size 6.5 US to size 14 US while the women’s sizing is from size 5 US to size 11 US. Half sizes are also available. The shoe, though, may run small. The two-tone geometric mesh material that covers the upper construction of the Adidas Questar Drive provides proper ventilation for the foot of the wearer. It also exhibits a rather eye-catching and stylish appearance with the attractive color combinations it presents. Finishing off the design of the sneaker is the Cloudfoam midsole that gives off excellent comfort for the wearer. The Adidas Questar Drive features a TPU eyestay. A webbing heel pull can be observed on the sneaker. The tongue pull of the shoe displays the Adidas wordmark. The low-top shoe is built with the OrthoLite sockliner. The outsole of the sneaker is made of rubber.